SAP Data Warehousing Concepts deals with data extraction and usage as per t the needs. In transaction processing, we are constantly filling specialized tables that are optimized for displaying the thousands of different steps of our business processes.For example, sales and distribution document items flow in from sales documents and quotation documents. These become delivery header data, which then becomes invoice header data and is sent on as accounts receivable information.The tables in the Business Information Warehouse are different in that they do not process transactions. Instead, all information for a specific business process in BW is gathered together and analyzed. 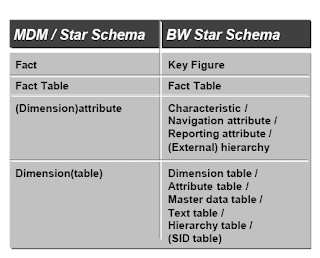 Data that has been loaded into BW from various source systems, is stored in BW in the form of star schemas. This type of table assignment is ideal for reporting purposes.The dimensions answer question such as "Who?" "What?" and "When?" The facts provide answers to questions such as; “how much money, how many people, how much did we pay”? 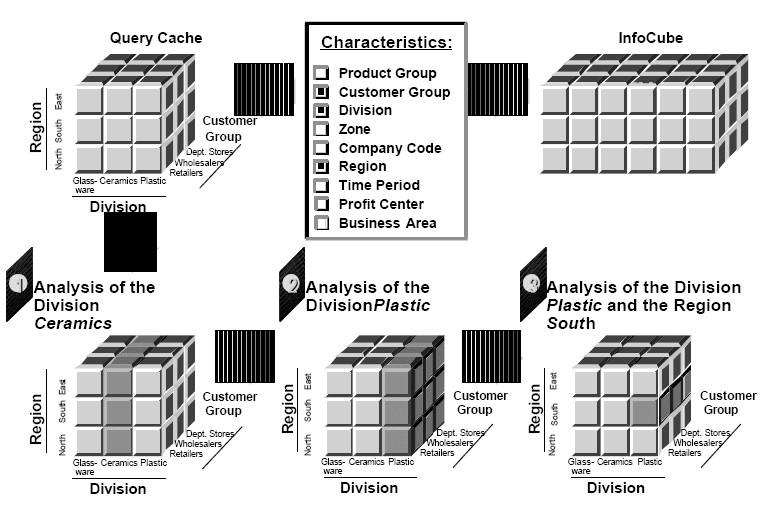 InfoCubes produce a multi-dimensional data model on the database server of the Business Information Warehouse. This allows the facts to be grouped in separate fact tables, and the dimensions to be grouped in separate dimension tables. Both types of table are interconnected. 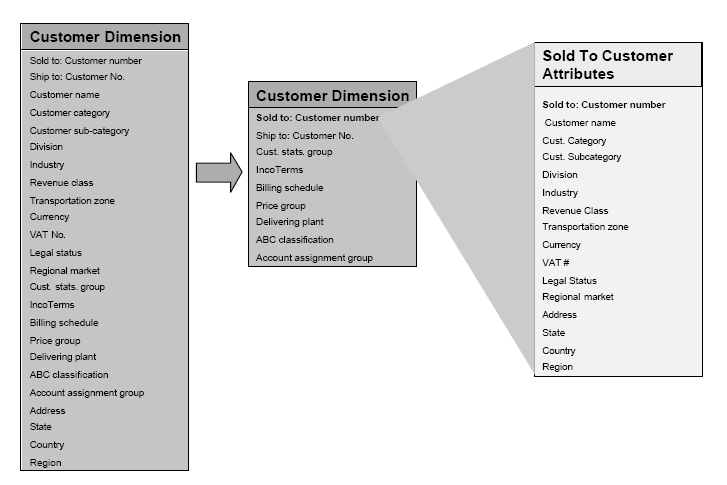 Individual dimension values can be subdivided further into master data tables. 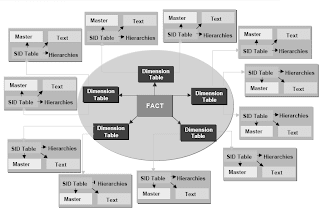 In this way, master data tables, text tables, hierarchy data tables, and dimension tables, are grouped in a star- like formation around one central fact table. This structure is called an extended star schema. 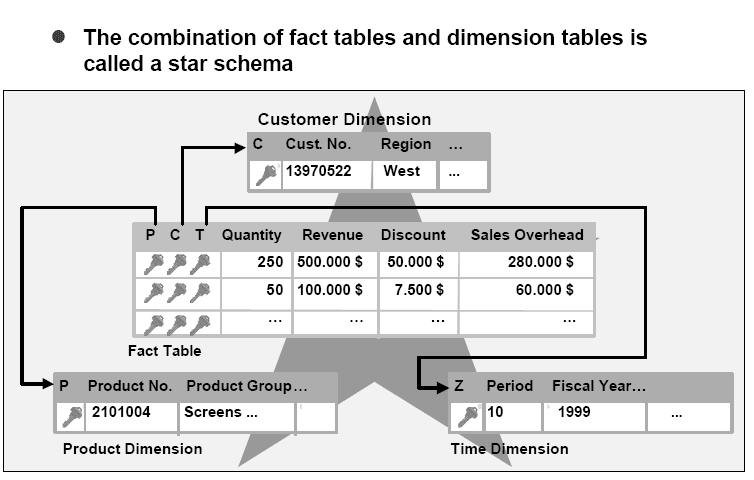 In an analysis, the data from the smaller tables at the edge of the star schema, is collected together first, before the corresponding data in the fact table is accessed using the keys. 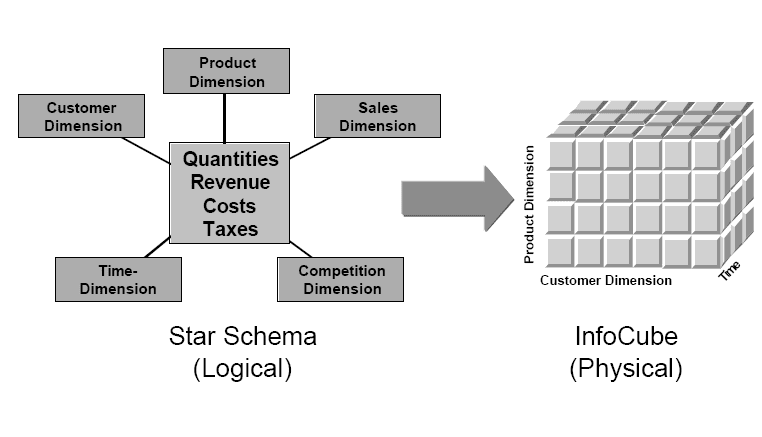 Structuring information in a data warehouse according to this star schema guarantees the efficiency of the reporting process, and provides a flexible solution that can be easily adjusted to changing business requirements.When you create an InfoCube, you choose the key figures and characteristics that you are going to require in your analysis. You have to group your characteristics together in a time dimension, a unit dimension, and a number of other dimension categories. On the basis of your entries, the system generates a star schema on the database automatic ally. 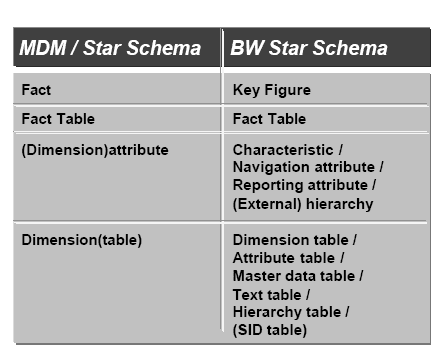 The BW extended star schema differs from the classic star schema. 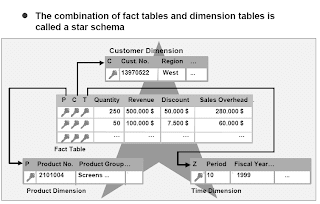 The BW star schema is divided into a solution-dependent part (fact tables and dimension tables = InfoCube) and a solution-independent part (master data tables, text tables, and hierarchy tables) that is also used by other InfoCubes. When designing the dimensions of an InfoCube, you must put a lot of thought into which characteristics you are going to use, and how you are going to arrange them in the dimension table. This is an important part of the data modeling process, since the choices you make here have a significant impact on the size, performance, and usability of the InfoCube data. The attribute tables, hierarchy tables, and text tables are not included in the InfoCube. This means that this data is maintained separately, and can be used across different InfoCubes. Common data warehouse terminology corresponds, for the most part, with BW terminology.In some cases, BW uses special terminology to describe various objects and processes. Granularity is a term used to describe the level of detail.If data has a high level of granularity, it means that the data is highly detailed and there are many characteristics describing the key figures. 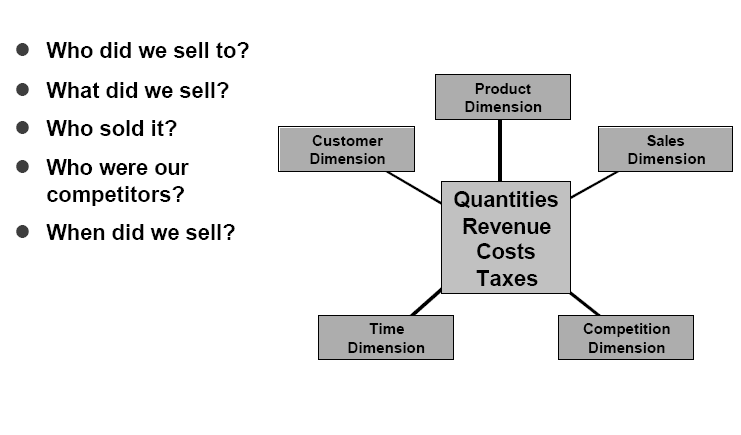 The level of granularity by customer, for example, is less detailed than by customer, by material. The level of granularity that a set of data has determines how far you are able to drill-down on the data. Granularity also affects the size of the database. Data that is stored by customer, by month is much more summarized than by customer, by day, by document, by document line item. A year’s volume of data for the first case would therefore be much smaller than for the second. 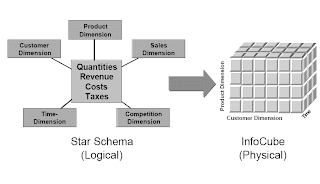 You use the term star schema, when you are talking about table structures conceptually, or from the perspective of data modeling. We talk about InfoCubes when we are referring to the actual set of tables where data is stored. In BW InfoCubes are used to create queries. 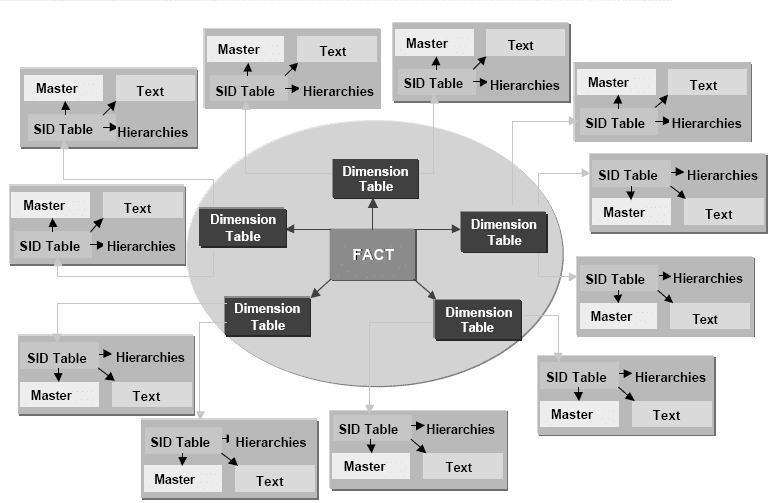 The fact table and the relevant dimension tables of an InfoCube are connected with one another by the dimension keys. 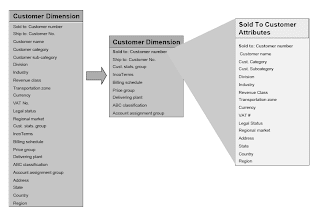 A dimension key is provided by the system, one per characteristic combination in a dimension table.When you execute a query, the OLAP processor checks in the dimension tables of the InfoCube that you want to evaluate, to see if they contain the characteristic combinations required by the selection.The dimension keys determined in this way, lead you to the information you need in the fact table. 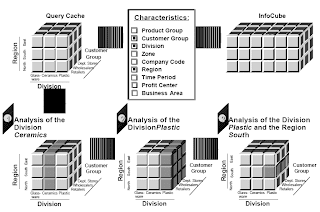 From the characteristics available in the dimensions of the InfoCube, you choose the characteristics that you want to use in your query.For these characteristics, a subset of data, called the Query Cache, is selected by the OLAP Processor and stored in the memory. This improves the query performance. From the data in the Query Cache, even more detailed views of the data can be generated. Filter values are used in the query to generate these more detailed views. This enables you to analyze specific divisions or regions.